As I mentioned in my Talking Stock #26 post here about the four Urie G16 class 4-8-0T locomotives, I do indeed have a soft spot for large tanks and therefore this post is about Urie’s other large tanks the five H16 4-6-2Ts. The later Maunsell Z class 0-8-0T locomotives were the subject of Talking Stock #19 post here, whilst Maunsell’s W class 2-6-4 tanks will soon also feature on this blog. The ex London and Southern Western (LSWR) Urie H16 class of 4-6-2 tanks were introduced in 1921, and if you have read my Talking Stock #26 post, you will know already that this was the same year as their slightly smaller sisters the G16 4-8-0T class. The two classes sharing many common parts such as motion, bogies, boilers and fireboxes. 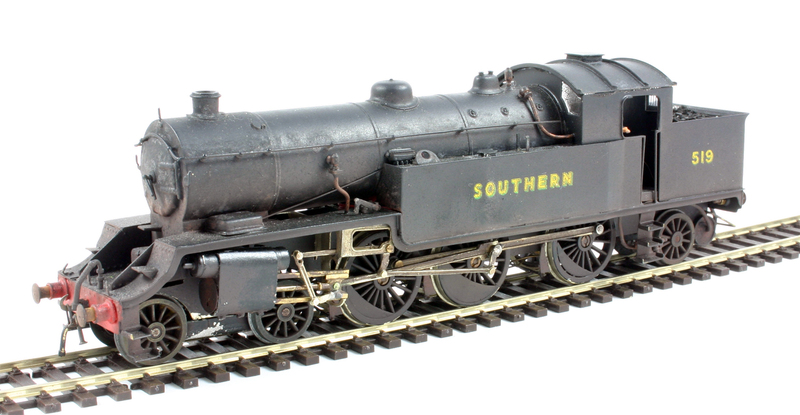 Urie H16 4-6-2T number 519 built from a Jedenco etched brass kit. Both classes were built in association with the new hump marshalling yard at Feltham. Rather than the four G16s which were designed for working in the confines of Feltham yard the five H16s were intended for cross regional goods traffic between Feltham and the North London yards of Brent (Midland) and Willesden (London North Western). For this duty they had 5’7″ driving wheels, larger than the G16s, larger water capacity and the extra large bunker was carried by a radial truck. As they were also used occasionally on empty carriage stock working between Waterloo and Clapham Junction and on special passenger trains, such as during Ascot Race Week, the H16s were initially given the standard Southern passenger livery of lined olive green unlike the black livery of the G16s, giving rise to their nickname amongst operating staff as ‘Green Tanks’. This changed to a plain black livery, in common with all Southern locomotives from 1940 due to watime constraints, and was retained during BR days until their withdrawal in 1962. H16 number 519 viewed from the other side and shows off the powerfull looking nature of these tanks that appeals so much. My model was built, with much effort, from a Jidenco etched brass kit; that owing to the quality of the kit design, thin etches and limited instructions, took a number of years of starting, doing a bit, getting frustrated and putting down again before finally getting round to finishing. Certainly not a kit for the feint hearted. 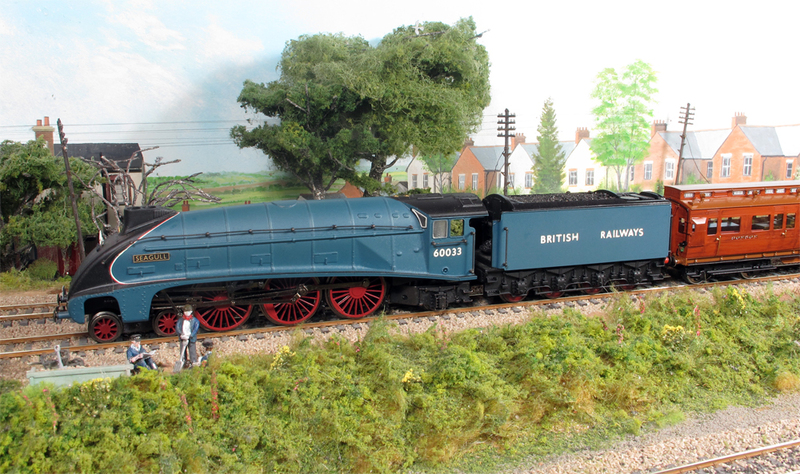 She is powered using a Portescap coreless motor along with quite a bit of lead weight added to provide adequate traction due to the lightweight thin etched brass construction of the kit with only the small dome, safety valves and chimney being white metal castings. My usual excuse for an occasional appearance on Fisherton Sarum of an H16, as they were only allocated to Feltham, is on a running in turn from Eastleigh although that does not really explain her weathered condition, so perhaps she was borrowed for a freight trip down the West of England line? The humble brake van was an every part of the railway scene up until the advent of continuous brakes for most freight stock in the early 1970’s. They initially served two purposes: to provide additional braking for ‘unfitted’ goods trains and of course somewhere for the guard to travel; later vans were also ‘fitted’ for working on such vacuum brake fitted formations. They were a weighted wagon equipped with a hand internally operable brake acting on all wheels they ranged from the 4 or 6 wheel type to sometimes 8 wheels and also bogie types. The ‘fitter’ versions having vacuum cylinders and able to operate the brakes on the fitted stock that make up the train (some vans were simply through piped to allow continuity of the braking system without being able to actually operate it, in such such cases just the hand brake was available for use. The guard’s accommodation often included one or two verandas, or closed ends with windows and many also incorporated side lookouts or duckets to allow a guard to look forwards along the side of the train. 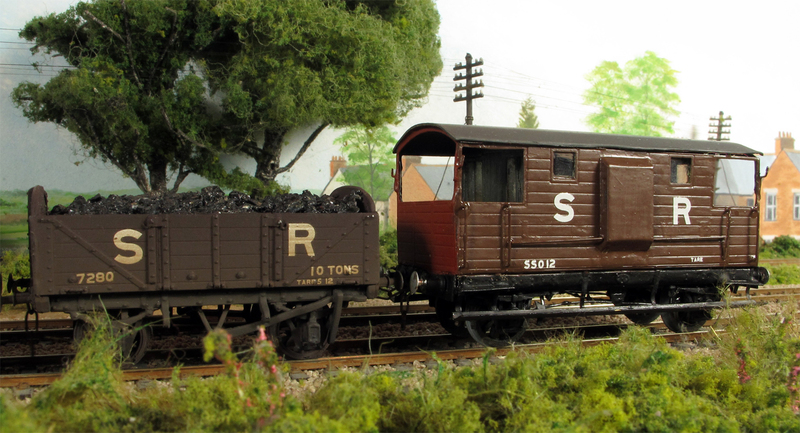 This post follows on from the announcement by Kernow models of their ready to run version of the ex LSWR 10T Road van to diagram 1541 and will look at a few kit built examples of brake vans that can be found running on Fisherton Sarum. 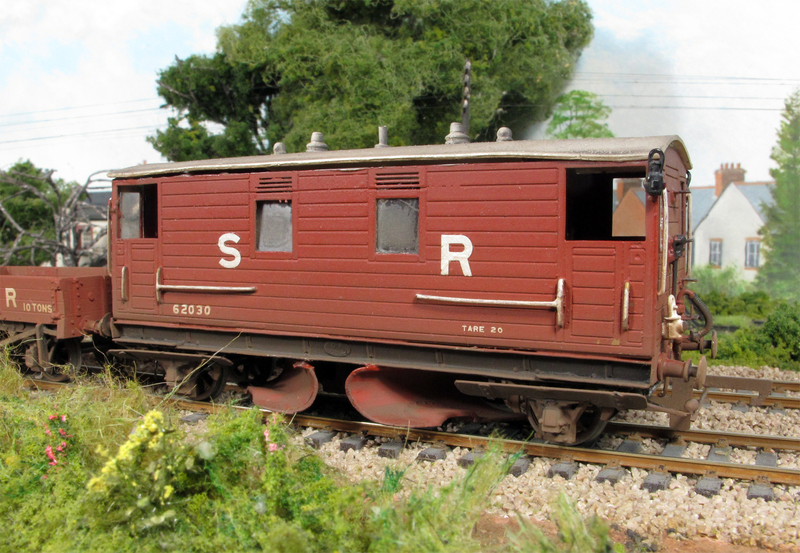 The ex LSWR 10T road van mentioned above was known as a road van as in addition to the guard’s accommodation and single veranda it has side opening doors on each side and the van could also be used the carrying of goods. 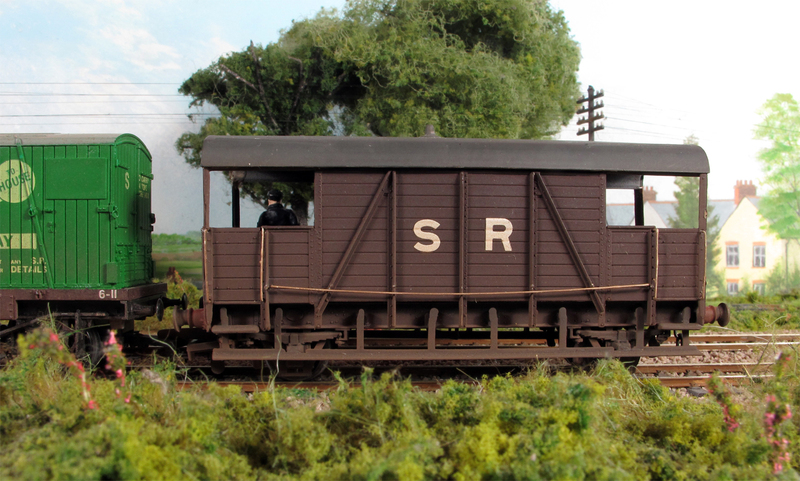 This van is currently available in resin kit form from The Smallbrook Studio. To the left can be be seen my model of the 20T Diagram 1545 Road Van also a resin kit form from The Smallbrook Studio. As well as being heavier that the Diagram 1541 road van they were also larger, had a veranda at both ends and side duckets. Staying with the LSWR seen left is my model 20T brake van to diagram 1543. This is built from a Jedenco / Falcon Brass etched brass kit. 75 of this this type of van were built between 1915 and 1921. They were known to staff as ‘new vans’ a name which they kept well into the 1950’s! Moving further east, I have a couple of ex SECR brake vans firstly is one that is perfectly at home on the ex LSWR metals as it is ex SECR 20T Ballast Plough brake van, diagram 1748, in the civil engineers fleet. The first lone prototype was built in 1914 with 3 more being built by the SR in 1932, a further 8 with slight detail differences were built in 1949. In addition to the brakes it also had ploughs to rake freshly applied ballast from hoppers in the same train. These ploughs could be raised or lowered as required from inside the van. This particular model, also built from a Jedenco etched brass kit, has already featured on these pages here along with its companion rake of 40t Ballast hoppers. Dia 1559 ex SECR ‘Dancehall’ Brake Van, yes must properly fix that handrail! 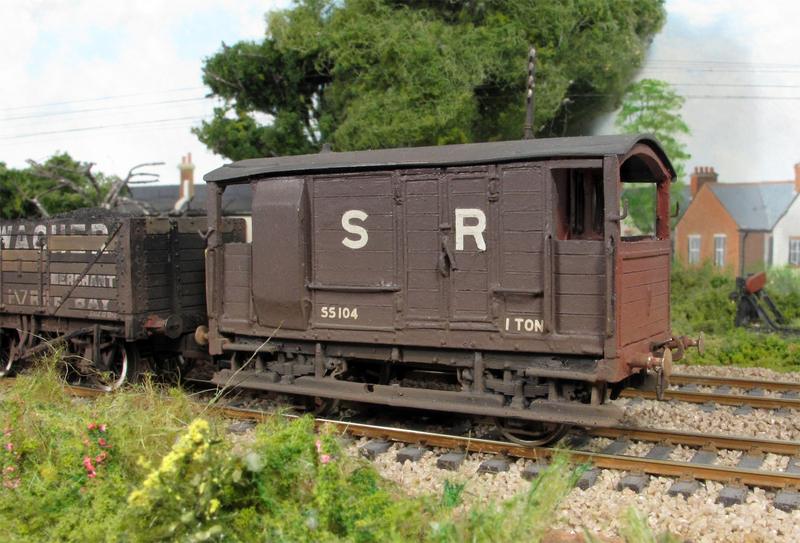 Finally for this post we see an ex SECR ‘Dancehall’ 25T brake van to Diagram 1559 First introduced in 1921., The SR built a further batch between 1923 and 1927 but these had deeper 15” instead of 12” channel underframes and were given the diagram number 1560. These vans gained the nickname ‘Dancehall’ due to the large amount of space inside them. They were long lived vans surviving, albeit modified, in departmental use right up until the 1970’s. This is built from a Cambrian Models plastic kit. There are of of course other SR related kits and ready to run brake vans available and some of these may well feature in future posts, although my review of the Bachmann RTR 25T ‘Pill box’ brake van can be read here. 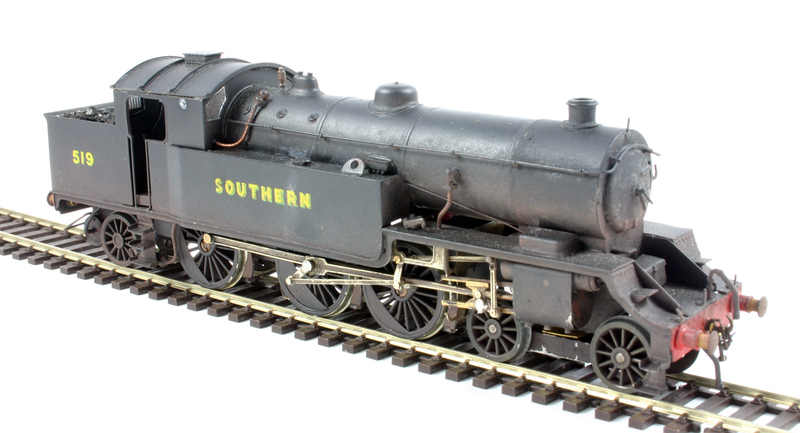 I have now made two previous posts on this blog about the 1948 locomotive exchange trials, and my models of the locomotives that featured on Southern metals and would have passed through Salisbury and therefore can occasionally be seen on Fisherton Sarum. The first Talking Stock # 2 post focused mainly on the Express Passenger and general purpose locomotive trials whilst the second post Talking Stock #30 focused on the less often referred to freight locomotives trialed. This post is by way of my own thoughts and conclusion about the actual trials themselves. 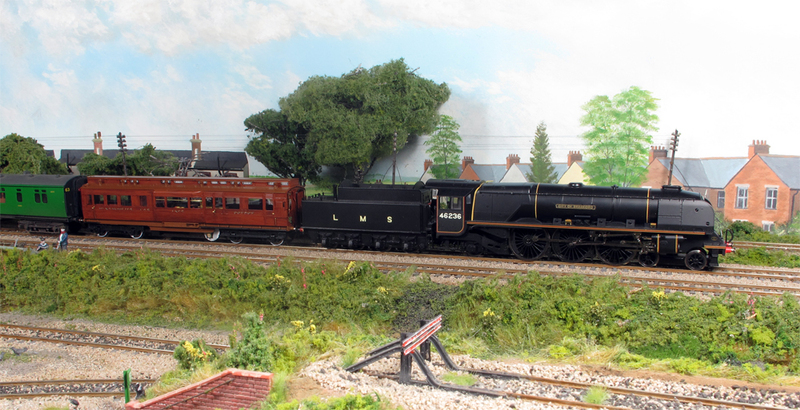 Ex LMS City of Bradford Heads past Fisherton Sarum onm an Exteter to Waterloo working. Note the WD tender fitted due to lack of water troughs on the SR. These trials were not attempting to judge an overall winner but to gain an insight and comparisons of good design and practice that could be in theory carried across into the future design of new British Railways steam locomotives. A number of observers are of the opinion that the trials should have been larger to encompass more locomotive varieties and that there are some notable missing classes. Some of the missing classes that have been mentioned include: the Western Region’s Castle Class, the London Midland Region’s Royal Scots or Jubilees, the Eastern Region’s V2s and of course the Southern Region’s Lord Nelson; of which a direct comparison with the Royal Scot Class would have been very interesting due to similarity on the origins of the designs. Also as I mentioned in my Talking Stock #30 post the Southern did not put any freight locomotive forward so perhaps the design of the S15 whilst being a possible contender was considered to be too old. ex LNER A4 Seagull heads towards Exeter. One major inconsistency that directly affected all the recorded parameters, despite all the precautions taken, was with the locomotive crews. The method of engine control varied; from those crews trying to be as economic as possible, such as the London Midland crews, whom allowed timings to slip to the benefit of coal consumption; whilst others, especially the Southern Region crews, were keen to show the best of what the engines could do performance wise including some extremely impressive hill climbs. Coal and water, but not oil, consumption’s were all recorded and compared along with horsepower outputs and overall efficiencies. These therefore varied considerably by the style of driving. Additionally; loads on each test run varied rather than being controlled to be something near constant and that on a number runs considerable signal checks were experienced rather than Control ensuring a clear run where possible. Also the Southern Region crews were not used to such prolonged running due to the relatively short maximum length of route available; 143 miles, between Waterloo and Exeter compared to runs on other regions ranging from 172 to 299 miles. The later being between Euston and Carlisle which was also longer than usually worked by the Eastern Region crews too. As all locomotives were coaled with Yorkshire hard coal this immediately put the Western Region engines at a slight disadvantage as the drafting arrangements for these engines had been designed around the use of softer South Wales steam coal. Subsequent additional tests were carried on the Western Region with these engines on their more usual South Wales steam coal which did result in an improvement in coal consumption. In the express passenger group it was a close run thing on efficiencies between the Eastern A4s and the London Midland Duchess Class. All of the Pacific’s were very consistent across all runs; however the results of the 4-6-0s varied more across the different routes. In the general purpose engines group the Southern Region West County Pacific’s put in some brilliant and very impressive performances but these were at the expense of efficiency figures as already implied. The London Midland Region Class 5’s showed the best efficiencies of this group. The Eastern Region B1 class showed some considerable fluctuations in efficiencies between routes. The greatest variation in overall efficiencies was experienced with the freight group with no engine type being consistent across all routes although the closest to this was the Eastern Region O1 class, but it put in a variable performance on the Eastleigh – Bristol route for an unexplained reason. The widest variation of all in efficiencies and performance was seen with the Ministry of Supply WD 2-8-0 and 2-10-0 locomotives. In fact the 2-8-0s did not on the whole distinguish themselves very well at all. Whilst the Eastern Region A4 class locomotives put in some fine performances they were marred by the fact that there were three failures during the testing attributed to the middle big end overheating on each occasion. The data recorded and utilised in the final report was not generally seen by most as being fully conclusive, not helped by the fact that it took no account of the costs of construction or average costs of maintenance for each locomotive design. Whilst it is also generally considered that future British Railways standard designs perhaps bore more resemblance to the origins of their designer, the trials were if nothing else a Public relations exercise for the newly formed British Railways as a show of unity between the now Regions.